A floodplain is a land area subject to overflow from a river or lake, and to a variety of human management schemes. The management strategies encompass a spectrum from leaving the area in its natural state to comprehensive changes in both the water flow and the societal uses of the land. A flood commonly is defined as any level of flow that exceeds the natural carrying capacity of a river and that inundates the adjoining low-lying land (i.e., the floodplain) which ordinarily is dry, although some floodplains have large areas of wetlands . Of all the natural hazards, floods are among the most widespread and most ruinous to life and property, particularly as more people live near water. 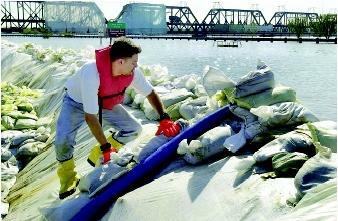 A city worker checks one of the pump hoses discharging floodwater back into the Mississippi River in Davenport, Iowa during a 2001 flood (which approached the record flood of 1993). Davenport is the largest city along the Upper Mississippi River without floodwalls, and hence relies on sandbags and other protective measures. Content of sediment and debris. A small mountain stream may go over its banks a few feet in a few hours on the average of once in 50 years, carrying rocks and forest debris. In contrast, a large stream in an alluvial delta may rise over adjoining lands as much as 10 feet during several weeks, carrying a large volume of sediment, with this event also occurring on the average of once in 50 years. The average frequency of occurrence of a flood of given magnitude(e.g., a 25-year flood, 100-year flood , or 500-year flood). A long list of societal costs including human life, illness, emergency response, property and crop loss, and interruption of business and social activities. Because there are no universally accepted monetary criteria for measuring such benefits and costs, it is not practical to compute fundamentally consistent numerical estimates of the effects of flooding in all situations. Criteria vary from place to place, and over time. In the United States, there are at least eight major types of societal strategies for managing floodplains. Each involves a decision, either planned or unplanned, by a landowner, government entity, or combination of land management agencies regarding the benefits and costs that will be promoted by a given system of land-use management and the land's vulnerability to flooding. Each strategy implicitly involves recognition of the extent to which the various stakeholders involved are vulnerable to flood benefits and losses. A management practice pursued by many communities around the world is to incorporate a combination of some of the above flood-related measures in plans for guiding urban development. A major part of some of those plans is the designation of areas to receive specified degrees of structural flood protection (e.g., floodwalls) along with prohibition of new urban development in hazardous areas where structural protection measures are not planned. Maintaining the natural ecosystem for beneficial purposes of wildlife conservation , human recreation, and enhancement of water quality may result in no explicit effort to change the flood regime or to alter vulnerability to benefits and costs from flooding. This strategy is present in some public parks and wildlife preserves and in reserves of land that might, unless retained in their natural state, cause higher flood flows or higher sediment loads downstream. Some agricultural uses of floodplains may result in net human gains, taking into account the yields of suitable crops and pasture that benefit from average flood flows, and also allowing for occasional losses from large or unseasonal flows. There are many instances of cultivation of floodplains in which the risk to life and property is minimized and the gains in agricultural production are maximized. Numerous urban areas contain small floodplains that are occupied for purposes that are not highly vulnerable to flood loss. For example, city parks, golf courses, playing fields for schools, nature preserves, and lawns for suburban residences may be used when there is no flooding, but avoided at flood time. More common in urban areas than open spaces are partial or complete residential, commercial, or industrial sections which are vulnerable to flooding and yet not subject to flood control, and in which there is no organized community effort to reduce the risk of loss. The occupants simply bear the loss without any planned response. As an extreme, they may consequently lose all their belongings and resources in a disastrous flood. Sandbagging around their home if floodwaters threaten. In building new structures, property owners can locate floors above the prospective flood level, or design furnaces and other critical features so that they are protected from high waters. This flood-proofing depends on preventive action and on receipt of early warning of imminent flooding. Community groups may promote and maintain, in cooperation with state and national agencies, systems for the issuance and dissemination of flood warning, and for the provision of emergency services to facilitate evacuation, rescue, and rehabilitation services. All of the above actions assume there will be a flood, with little human intervention to prevent the flood event itself. But the most attractive set of measures to many communities involves engineering construction to reduce the frequency and magnitude of flooding. This has been a favored strategy for public expenditure where the anticipated construction costs are less than the expected loss reduction. Flow detention in reservoirs that are either single-purpose or multi-purpose. Until the mid-twentieth century, insurance against flood losses was rarely available in the United States from private insurance companies, even though it could be purchased in some other countries. 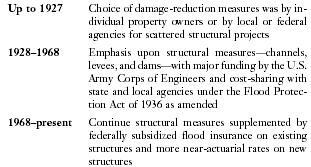 This situation changed drastically in the United States in 1968, when the U.S. Congress enacted legislation providing for a federally financed National Flood Insurance Program. Under this program, each community with identified flood problems would be provided with maps of its hazardous areas. The community would then be given the opportunity for its property owners to purchase insurance against flood losses and encouraged to adopt various mitigation measures. Properties already built in flood hazard zones were given subsidized premium rates. Newly constructed properties were to be insured at actuarial rates. To qualify for participation a community must, among other requirements, regulate land use in the 100-year flood zone. Many maps also show various zones with probability of flooding as infrequently as once in 500 years, on average. 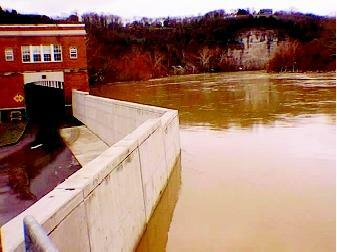 The construction of a floodwall in Frankfort, Kentucky was barely finished when it protected South Frankfort during a major flood in 1997. The floodwall runs through part of the Second Street Elementary School (shown here). program was initiated with selection of the 100-year flood as the criterion and without any analysis of the policy consequences until an assessment was begun in 2000. In the United States, the unfolding of public policy with respect to floodplain management has involved three phases of emphasis, summarized as follows. In recent years, the Federal Emergency Management Agency (FEMA) has placed increasing emphasis on encouraging communities to adopt and enforce plans that seek to reduce uneconomic flood losses through a combination of structural measures, land-use plans, emergency warning and response plans, and flood loss insurance. FEMA, an independent agency of the federal government that reports directly to the President, is tasked with responding to, planning for, recovering from, and mitigating against disaster. The beginnings of FEMA can be indirectly traced to the Congressional Act of 1803, the first piece of disaster legislation in the United States, and directly to then-president Jimmy Carter's executive order in 1979 that centralized federal emergency functions from throughout the government into a new emergency management agency. Today, FEMA is a 2,500-person agency, supplemented by more than 5,000 standby disaster reservists that can be called upon in times of emergency. SEE ALSO Army Corps of Engineers, U.S. ; Cost-Benefit Analysis ; Integrated Water Resources Management ; Land-Use Planning ; River Basin Planning . Abramovitz, Janet. "Averting Natural Disasters." In State of the World—2001, ed.Lester R. Brown. Washington, D.C.: Worldwatch Institute, 2002. Burton, Ian, Robert W. Kates, and Gilbert F. White. The Environment as Hazard, 2nd ed. New York: Guilford Press, 1993. Chow, Ven-Te, ed. Handbook of Applied Hydrology. New York, McGraw-Hill, 1964. Heinz Center for Science, Economics, and the Environment. The Hidden Costs of Coastal Hazards. Washington, D.C.: Island Press, 2000. Parker, Dennis J., ed. Floods. London, U.K.: Routledge, 2000. Yen, C. L., and Yen, Ben C. "A Study on the Effectiveness of Flood Mitigation Measures." In Rivertech: Proceeding of Rivertech '96: First International Conference on New/Emerging Concepts for Rivers. W. H. C. Maxwell, H. Preul, and G. E. Stout, eds. (1996):560–561. Association of State Floodplain Managers. <http://www.floods.org/> . Federal Emergency Management Agency. <http://www.fema.gov> . National Weather Service. <http://www.nws.noaa.gov> . Comprehensive estimates of actual flood losses are subject to great uncertainties. But two recent estimates of recorded flood damage are as follows, broken down into the United States and the rest of the world. For the United States: The average annual flood damages from 1929 to 1993 were estimated to decrease very slightly after normalizing for changes in gross national product. Annual flood losses totaled $5.2 billion during the period 1989 to 1998. For the World: Floods between 1950 and 2000 were estimated to account for one-third of all economic losses, half of all deaths, and 70 percent of all homelessness caused by extreme natural hazards.